Gong xi fa cai to those who are celebrating Chinese new year! Isn't it so exciting to receive items on your wishlist? Gladiator sandals - Thanks to Yoins.com for a great quality shoes. It was actually delayed on the delivery but it arrived in time for the new year. Talking about perfect timing! Floral watch - The bestie knows where to look for items I want. She took reference from my wishlist blog posts. She ordered this watch via Lazada.com.ph for she cannot shop in the malls because she just gave birth to my new inaanak. Choker necklace - Last Christmas, the kiddo asked if we could buy a gift for me. He noticed that on our Christmas tree Ive bought and wrapped lots of gifts for everyone but no gift named for me. So he wanted me to have a gift to open as well even if I already knew what's inside. What touches my heart the most is that, the thought that he wanted to buy me a gift, so I will have something to open for our New year gift opening tradition. He told me someday when he grow up he will surprise me with a gift. Forgive me for spazzing..... but my sons the sweetest ever!! He wants to buy me a pair necklace that both of us can wear. We happily found this lock and key necklace along with this rare-to-find choker necklace at Vanity Box. 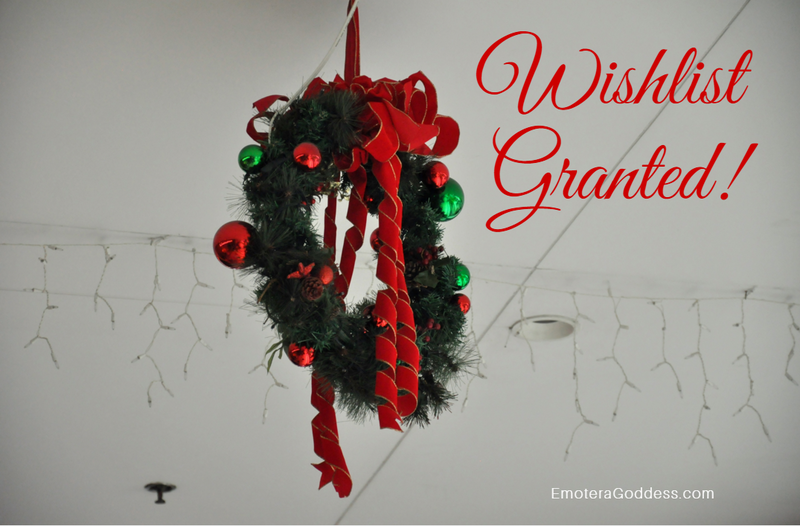 Did you also have a granted wish on your wishlist? What are those items? Im excited to read them in the comments below. loving those sandals, they look fab! Hi darling! It looks so comfortable..and of course fashionable..I like your fresh style.. Your blog is sooo nice to read! :) I was wondering if you'd like to follow each other, so we can keep in touch! If so just let me know once you're following me and I'll be right back! Hi Laura! Thank you very much for the compliments. Yes would love to connect with you. I love that gladiator sandals and choker. So happy for you! I hope my wishlist will be granted too. Please keep in touch! That watch is really pretty! You're a lucky girl. I like that little star as a necklace. It's like a lucky pendant and I love the idea. You got such beautiful things, lovely post! Those lace-up sandals are gorgeous!!! Yay! So happy for you! Amazing post! I love the lace-up sandals, they fit your legs perfectly and I can imagine them looking amazing with so many different outfits! What a lovely watch! hope you are enjoying your new gifts! and that you had a lovely Chinese New Year as well! Awesome pictures, Venus. Love them all! Thanks for sharing! Have a happy Valentine’s weekend! Awwww, you son is so cute, Venus!! So sweet of him. I' glad you guys get a present for you (both). Lovely post, dear!! What a lovely family you have.. Beautiful inside and out just like you are.